Sober Look: Tail risks lurk in the shadows. Fiscal cliff is out in the open. Tail risks lurk in the shadows. Fiscal cliff is out in the open. Merrill conducts a periodic survey of US institutional money managers. One area the survey focuses on is a set of questions on the so-called "tail risks", the less probable but potentially devastating events that negatively impact financial asset valuations. Here are the survey results from September and October of this year. The US fiscal cliff is clearly on people's minds and is quickly becoming the dominant concern in the financial community. If this survey were conducted today, the percentage of participants who would view the upcoming budget cuts and tax increases as the main risk to their portfolios would increase sharply. 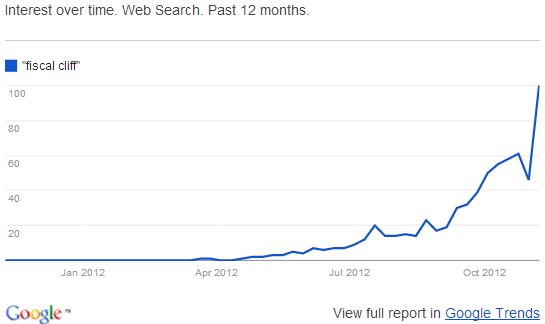 In fact, based on Google Trends, the public's concerns about the US fiscal cliff have spiked recently. Google search trend for "fiscal cliff"
But once certain risks become this widely "respected", they can no longer be called "tail risks". In fact as we saw in today's equity markets, these risks are already being priced into the markets. Tail risks are usually those events that are not fully priced, risks that are ignored, sometimes leading to formations of asset bubbles. What would be an example of such a risk these days? One potential candidate may be some of the US bond markets, for example credit (see discussion on corporate credit). Below is the famous CS Risk Appetite Index shown together with its US Credit Risk Appetite sub-index. US credit risk appetite is approaching what CS refers to as the "euphoria" level. CS: - US Credit Risk Appetite is a whisker away from Euphoria while Global Risk Appetite appears range-bound, close to its long-run average of about 1. US CRA being this close to Euphoria suggests caution- riskier corporate credit seems overbought both in absolute terms (yields are near record lows) as well as relative to safer credit. The last time the gap between Global Risk Appetite and US CRA was this large was August 2011, and it did not persist for long. Interestingly, the Merrill researchers who conducted the institutional investor survey (above), list "bond market bubble" as one of the key tail risks. And for those who still don't think we have a bond market bubble (and many investors don't), just take a look at the net fund flows in the last few years (bonds vs. equities). 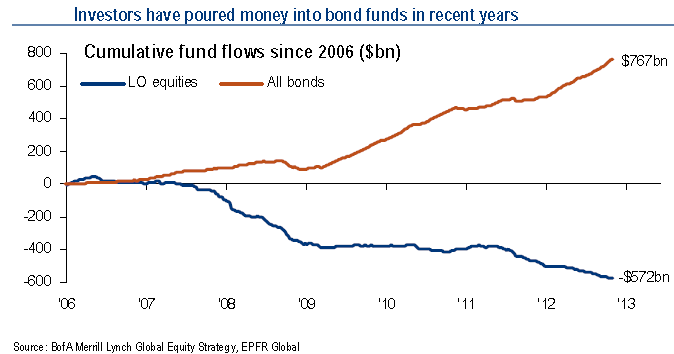 It doesn't mean that this bubble in bond markets can't persist for much longer. The US housing bubble lasted for years. Clearly the Fed continues to provide support to spread products for now, which makes the probability of a major spread widening quite low (thus a "tail risk"). 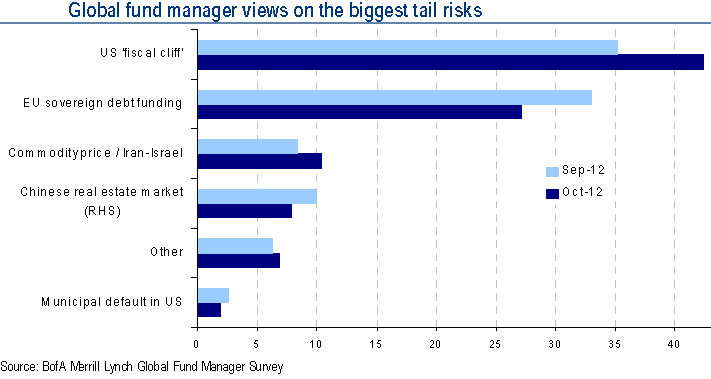 When looking for "tail risks", it is therefore not helpful to zoom in on areas where the investment community and particularly the public is already heavily focused, such as the "fiscal cliff". The time for that was back in April and May (see post), possibly even earlier. Instead one should look at the less probable events that most investors are now simply ignoring.